Custom home elevator installation is no longer only for the elderly or rich and famous. The unit and material costs have decreased quite a bit, and with a lot of innovations in the residential elevator industry, home elevators are starting to become a practical addition to one’s home. Our lifestyles are also changing as people live longer and need help aging in place. Having an elevator is beneficial for less mobile individuals and small children. They help eliminate possible falls and accidents that might occur by going up and down the stairs. Some homes may even be able to limit access to an elevator to help secure against unauthorized access to your home. For those looking to step up their home security game, installing a residential elevator could contribute to a more secure residence if utilized as part of a larger security package. Elevators can be restricted in terms of access so that only authorized people are allowed to use it. Security and safety are two major elements in making your home more comfortable. Stairs can be difficult to use or climb, and even can be dangerous in case of accidents and injuries. Accidents and injuries are truly a concern with the aging and with small children. Most people don’t realize that a home elevator takes up much less space than your usual standard stairwells. Having one installed can open up your house, providing you with more space. Homeowners that choose to invest in installing a residential elevator can easily increase the total use able square footage of their home, which ultimately helps to increase future home resale value. You could also use your new custom home elevator to carry bags of groceries, very heavy luggage, and even young kids without worrying about a strenuous or dangerous climb up the stairs. Elevators for home use can make constant trips including climbing stairs or moving heavy, bulky items much easier. This functionality is very noticeable in a residential elevator setting where lots of trips with household goods, shopping, and changing levels in your home are a daily occurrence. 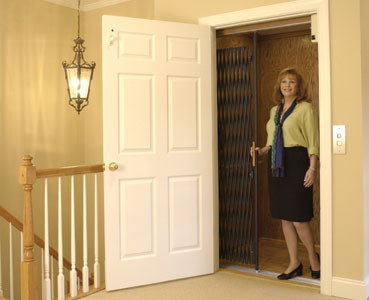 Improving your overall mobility is one of the leading benefits of utilizing home elevators. Of course, those who require greater physical effort to move about their multi-level home after injuries or later in the aging process will benefit from an elevator the most, by eliminating much of the usual exertion and stress of moving around your home or moving objects. Installing a home elevator can add significant resale value to your home, which makes residential elevator installation a profitable investment. Many of your prospective home buyers will gravitate toward homes featuring home elevator access for the cool factor, as well as the extra ease of mobility. This is because many buyers are looking to the future where accessibility may become a big deal for them, if their mobility diminishes. Even if you are not currently getting benefits from every mobility aspect of the residential elevator, it can significantly increase your home’s resale value over time. Home buyers are looking for ways to age in place, which means making mobility upgrades and home improvements through remodeling that help them maintain a certain level of comfort and mobility throughout their older years. Installing an elevator will also add that air of overall sophistication and style to your home. The large variety of available elevator designs means that there is a look to suit the taste of every homeowner and to match your home décor. There are modern glass tubes, and sleeker elevator cubes with brushed stainless steel frames and polished glass walls, or even more classic looks with amazing wood veneers and brushed nickel. Even if you have a bedroom on the main level of your home, the upper floor needs your attention over time and you definitely want to be able to access all areas of your home. Aging doesn’t have to prevent you from going up and down your stairway when you can have a custom home elevator installed by Access & Mobility in Middle Tennessee and Southern Kentucky. With one of these custom elevators you’ll have your entire home available to you once again. We also bring the additional assistance and mobility products that you need to make sure you and your spouse (or parents) are equipped to age in place. Home elevators have long since been viewed as a symbol of luxury, and that still holds true today; but with the reduced costs of materials, construction, and installation, you have much easier access to home elevators. 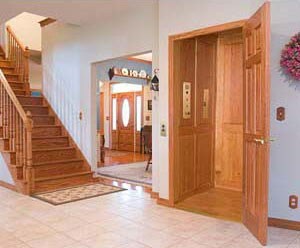 Contact Access and Mobility today for a conversation about adding a custom elevator to your home. We are here to help you make the right decisions for your home’s value and your mobility needs.